In a certain kingdom there lived an unmarried tsar. He employed a rifleman whose name was Andrey. -	Don�t kill me! Take me home, put me on the windowsill, strike me with your right hand as soon as I begin to doze and you will find your happiness. Andrey the Rifleman was very surprised and understood that the bird was enchanted. He came home put the turtledove on the windowsill and began to wait. The bird put its head under its wing and began to doze. Andrey remembered all instructions and stroke the turtledove with his right hand. At that moment the bird fell in the ground and turned into a beautiful girl whose name was Marya Tsarevna. -	I�ll be your faithful and merry wife! - she exclaimed. -	Andrey, we live in want. Buy different silk cloths, I will improve the situation. Andrey the Rifleman agreed, went to his friends, borrowed 100 rubles, bought silk and brought it to his wife. Marya Tsarevna wove all night and made a carpet. Next morning she showed it to her husband. The carpet was wonderful, the whole kingdom was pictured on it: towns, villages, forests, fields, birds flying in the sky, animals in the mountains, fish in the sea, the moon and the sun. -	Bring this carpet to the market and sell it to merchants. Don�t quote your price, take money that people will give you and come back. Andrey took the carpet and went to the market. Many people wanted to buy the carpet in the market, but nobody could quote a price, because they had never seen so wonderful carpet. The Tsar Adviser who accidentally was strolling nearby saw the crowd and could hardly squeeze through it. - Where have you found this splendid carpet? - he asked. - My wife�s woven it, - Andrey the Rifleman replied. - I don�t know, my wife forbade me to bargain. The tsar adviser gave Andrey ten thousands rubles, took the carpet and went to the palace and the Rifleman came back home. -	Do everything you want; I won�t give you back the carpet! The Tsar gave his adviser twenty thousands rubles and took the carpet. He went to the village where Andrey the Rifleman lived, found his house and knocked at the door. Marya Tsarevna opened the door. The Tsar Adviser had never seen so beautiful maidens; he stood motionless and couldn�t even say a word. Marya tried to compel him to speak, but everything was in vain and she shut the door. -	Why are you so sad? -	I�ve seen the Rifleman�s wife and I can�t help thinking of her, � the adviser replied. The Tsar was very surprised at this confession and decided to look at Marya Tsarevna. He put plain clothes on, went to the village, found the Rifleman�s house and knocked at the door. Marya opened the door. The Tsar stepped across the threshold and became dumb. He had never seen such beautiful maidens. Marya was waiting for his response but he could neither speak nor stir. She turned him round and shut the door. -	Think out how I can rid of Andrey the Rifleman. I wand to marry Marya Tsarevna. If you help me I will endow you richly with towns, villages and gold. If you don�t solve my problem, I will execute you. - Why are you so sad? Buy me a glass of wine and I will give you a piece of good advice. -	It�s easy to get rid of Andrey. Propose him the following riddle: �Go to the next world and find out how the deceased tsar is getting on.� Andrey won�t be able to solve this riddle. -	Go to the next world and find out how my father is getting on. Otherwise I will execute you. -	Don�t be so sad! It�s easy to solve this riddle. -	Go to the Tsar and ask him to let the Adviser accompany you. The Adviser will confirm your being in the next world. The ring will show you the way. Andrey the Rifleman took the sack, the gold ring and went to the next world accompanied with the Tsar Adviser. They passed wide green fields, marshes, long rivers, blue lakes and entered the thick forest where the ring stopped. Andrey and the adviser sat under the tree to eat rusks and saw the unusual scene: the deceased tsar were pulling a big cart and two devils were hurrying and beating him with cudgels. Andrey asked the devils to release the deceased tsar but they didn�t want to do it because they were pressed for time. -	Take this man to replace the tsar, - offered Andrey the Rifleman, showing the Tsar adviser. The devils harnessed the Adviser to the cart and began to hurry up him with cudgels. Andrey began to ask the deceased tsar how he was getting on. -	As you see I live badly. Bow to my son and transmit my request not to offend people. Otherwise he will repeat my destiny. Andrey thanked the tsar, unharnessed the Adviser and they went back. In the palace Andrey told the Tsar how his father was getting on in the next world and the Adviser confirmed everything. The Tsar let Andrey go home and called the Adviser. -	Think out how I can rid of Andrey the Rifleman. If you help me I will endow you richly, otherwise I will execute you. - Why are you so sad? Buy me a glass of wine, I will give you a piece of good advice. -	Propose Andrey the Rifleman the following riddle: �Go to the furthest kingdom and catch Cat the Lullaby Singer.� Andrey won�t be able to solve this riddle. -	You�ve carried out my first order well, but I have another task for you to perform. Go to the furthest kingdom and catch Cat the Lullaby Singer. Otherwise I will execute you. -	Go to the furthest kingdom. Cat the Lullaby Singer will make you sleepy as soon as you rich the frontiers of the kingdom. Don�t sleep, otherwise Cat the Lullaby Singer will kill you. 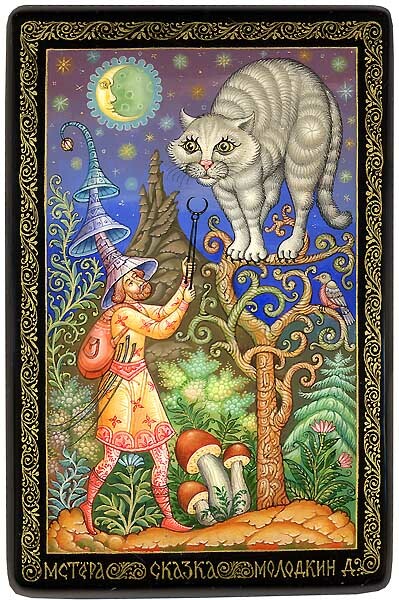 Then Marya Tsarevna told Andrey what he should do to catch the cat and he set out on his journey. Having reached the frontiers of the kingdom Andrey wanted to sleep. He put three iron caps on to protect himself from the cat�s sorcery, overcame drowsiness, entered the kingdom and soon reached the high post on which Cat the Lullaby Singer was sitting. The cat noticed Andrey, jumped on his head and smashed two iron caps at once. It hadn�t time to smash the third one. Andrey grasped the cat with the iron pincers and began to beat it with the iron switch. He broke it and began beating the cat with the copper switch. Having broken it Anrey went on beating the cat with the tin switch. Cat the Lullaby Singer begged for mercy. -	Stop beating me, - it said. -	Will you go with me? � asked Andrey. -	I�ll go everywhere you wish, � replied the cat. Andrey the Rifleman came back to his kingdom, went to the palace and showed Cat the Lullaby Singer to the Tsar. - Think out how I can rid of Andrey the Rifleman. If you help me I will endow you richly, otherwise I will execute you. -	Let the Tsar send Andrey the Rifleman to the unknown land and bring something that nobody has never seen. - You�ve carried out my second order well, but I have another task for you to perform. Go to the unknown land and bring something that nobody has never seen. Otherwise I will execute you. Andrey went home, sat on the bench and began crying. -	What has happened? � Marya Tsarevna asked him. -	The Tsar has ordered me to go to some unknown land to bring something that nobody has never seen. -	It will be difficult to perform this service, - Marya replied. She opened her magic book and began to read it trying to find the solution of this riddle; everything was in vain, she couldn�t find anything. Marya Tsarevna entered the porch and waved her kerchief. At that moment plenty of different birds and animals gathered near the porch. -	Forest animals and birds flying in the sky, do you know where the unknown land is situated and where it�s possible to find something that nobody has never seen. -	No, we don�t know. Marya waved her kerchief again. Two giants ran to her. -	Carry me in the middle of the ocean, - ordered she. The giants carried her in the middle of the ocean. Marya Tsarevna waved her kerchief. Different fish and sea reptiles swam to her. -	Do you know where the unknown land is situated and where it�s possible to find something that nobody has never seen, - she asked them. Marya Tsarevna became sad and ordered the giants to carry her home. Next morning she equipped Andrey for his journey, giving him a clew and a towel. -	This clew will be moving and showing you way. Remember the only thing: wherever you�ll be, wipe your face with this towel. Andrey said goodbye to his wife and began his journey. He passed many kingdoms and different lands and entered the thick wood. The clew stopped near the hut standing on hen's legs. Baba Yaga was sitting near the hut. -	I hate human beings! I will roast you! -	I�m very dirty. Let me wash myself in the bathhouse and then you may eat me. Andrey the Rifleman washed himself and began to wipe his face with the towel that his wife had given him. -	It�s my daughter�s towel! � Baba Yaga exclaimed. -	Your daughter is my wife, - Andrey replied. Baba Yaga made supper and fed Andrey. He began to tell her about his life and said what riddle the Tsar had proposed to him. -	I don�t know where the unknown land is situated and where it�s possible to find something that nobody has never seen. The old frog may help you. It has been living in the marsh for three hundred years and it knows everything. Andrey went to the marsh, found the old frog and asked it to help him. -	I�m very old. I�ll help you if you put me in the pot of milk and deliver me to the Fiery River. Andrey the Rifleman put the frog in the pot of milk and continued his journey. Soon they came to the Fiery River. The frog began to swell up and turned into the enormous frog. It jumped and carried Andrey in the opposite bank of the river and became small again. -	Go this path and you will see the house where you can find something that nobody has never seen. -	Naum the Matchmaker, I want to eat! -	Naum the Matchmaker, clear the table! - Naum the Matchmaker, I want to eat! At that moment different food appeared on the table. -	Naum the Matchmaker, sit at the table and eat with me! � offered Andrey. -	Thank you very much. Nobody has never offered me to eat. � answered Naum the Matchmaker. The food began to disappear of its own accord from the table. -	Can you show up yourself? �asked Andrey. -	No, I can�t. Nobody can see me. I am something that nobody has never seen. -	Do you want to serve me? -	You are very kind. I will serve you with pleasure. -	Carry me in my kingdom! � exclaimed Andrey. They flew over the ground; forests, mountains, towns and villages were flashing beneath. Andrey was very tired and offered Naum the Matchmaker to rest. -	Three merchant ships will arrive here soon. They will show you three wonders. Exchange me for these wonders and don�t be afraid, I will come back to you. The prediction came true and Andrey saw three merchant ships sailing to the island. Andrey met the merchants and invited them to eat supper. -	Who has made this supper? Who has cooked these delicious dishes? � asked the merchants. -	My servant, Naum the Matchmaker, has made this supper, - replied Andrey the Rifleman. -	Who has built this wonderful gold palace? � the merchant continued their asking. -	My servant, Naum the Matchmaker, has built this palace for the night, - answered Andrey. -	Naum the Matchmaker, where are you? -	I am here, - replied Naum the Matchmaker. -	Carry me in my kingdom, - ordered Andrey. -	The Tsar has burnt our house to ashes and tried to compell me to marry him. -	Naum the Matchmaker, are you here? Build a palace! At that moment a wonderful palace surrounded with a splendid park appeared. Andrey the Rifleman and Marya Tsarevna settled in this palace and lived happily. The Tsar found out that Andrey came back and built the palace in his kingdom. He was infuriated and declared war to Andrey the Rifleman. Andrey noticed the Tsar�s army and found his three wonders. He seized the magic axe and at that moment the axe built one hundred of ships. Then he took the magic pipe, blew it and at that moment the army including cavalry and infantry appeared. The Rifleman�s army defeated the Tsar�s one. The Tsar was very frightened and decided to run away. Andrey grasped the magic cudgel and ordered it beat the Tsar. The cudgel became beating the Tsar and killed him. Some time passed. People of that kingdom gathered and asked Andrey the Rifleman to be their tsar. Andrey agreed, arranged a great feast and ruled that kingdom till his death.